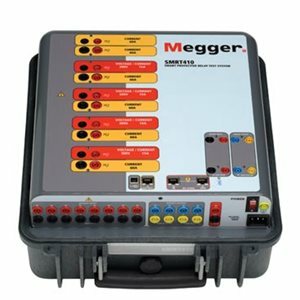 The SMRT410 test system may be customized by adding the number of Voltage-Current, “VIGEN”, modules needed for specific test applications. The SMRT410 has the “smart” combination of high compliance voltage and high current to test all electromechanical, solid-state and microprocessor-based overcurrent relays, including voltage controlled, voltage restraint and high impedance directional ground overcurrent. The SMRT410 provides a complete multi-phase test system for commissioning of protection systems. With up to 4 voltage channels a 6 high currents, the SMRT410 meets every testing need. The SMRT410 VIGEN modules also provide high power in BOTH the voltage and current channels to test virtually all types of protective relays. The SMRT410 test system has the ability to be manually controlled with Megger’s new Smart Touch View Interface™ (STVI). The STVI, with its large, full color, high resolution, TFT LCD touch screen allows the user to perform manual, steady-state and dynamic testing quickly and easily using the manual test screen, as well as using built-in preset test routines for most popular relays. For full automatic testing the SMRT410 may be controlled by Megger Advanced Visual Test Software (AVTS). AVTS is a Microsoft Windows® XP®/Vista™/7 compatible software program designed to manage all aspects of protective relay testing using the new Megger SMRT.